On Monday afternoon, as markets fretted over the possibility of the United States government running out of money to pay its creditors, Rep. Allen West (R-Fla.) held a briefing on a crisis that could bring the nation to its knees. “This is about the protection of each and every American citizen who ever resides within our borders,” West told the audience in the basement of Rayburn House Office Building. It was a tangled web—Leitner conceded that his diagrams are “kind of like looking at a plate of spaghetii”—but that was precisely the point: According to Leitner, the Muslim Brotherhood made the plot so vast and multifaceted as part of a campaign of “intentional denial and deception through intentional complexity.” In other words, the conspirators made their conspiracy so big and so omnipresent that the public lost its ability to see the forest for the treason. But don’t call Leitner a black-helicopter type: “You don’t have to be a conspiracy theorist to understand there really are conspiracies in the world,” he said. Courtesy of Citizens for National SecurityCitizens for National Security’s report was preceeded by a big announcement that the group would be releasing the names of 6,000 active members of the Muslim Brotherhood. But when the big day came, the group stated that the names would actually be kept under wraps and only released to select “responsible parties.” In a response to a query from Wired‘s Spencer Ackerman, Leitner conceded that the people on his list had not necessarily been charged with any crimes. 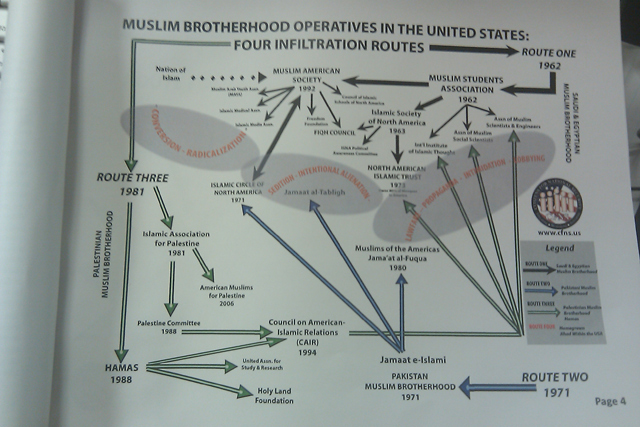 Instead, they were just people who are involved with organizations he had connected to the Muslim Brotherhood—like the Muslim Students Association. We already have a Fifth Column that is already infiltrating into our colleges, into our universities, into our high schools, into our religious aspect, our cultural aspect, our financial, our political systems in this country. And that enemy represents something called Islam. And Islam is a totalitarian theocratic political ideology; it is not a religion. 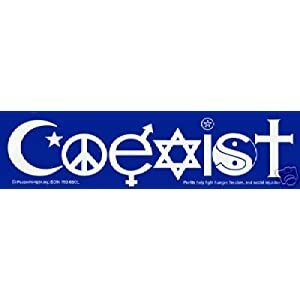 It has not been a religion since 622 A.D., and we need to have individuals that stand up and say that. Folks like West and the CFNS want to have it both ways. They cast as wide a net as possible and call for the Muslim Students Association to be classified as a terrorist group. But then they tell the handful of MSA members who attended Monday’s presentation that no one is calling them terrorists. Islam isn’t the enemy—except for when it is. Large groups aren’t responsible for the actions of a few fringe members—except for when they are. If the Muslim Brotherhood seriously intends to implement Shariah law over the United States, the group faces long odds. Ninety-eight percent of Americans are not Muslim. Of the remaining sliver, the overwhelming majority seem pretty satisfied with our current system of constitutionally protected religious freedom. For a conspiracy that’s been operative since 1962, things sure are moving slowly. But there was one gaping omission from Leitner’s report that might have redeemed the whole thing. Frank Gaffney of the Center for Security Policy* alleged last summer that Americans for Tax Reform founder Grove Norquist was secretly an agent of the Muslim Brotherhood. And it’s Norquist, along with a host of influential conservative leaders like RedState’s Erick Erickson, who are leading the charge against any sort of reasonable deal on the debt ceiling—sending the federal government careening toward a default, which would crush the economy and cause tens of millions of Americans to lose whatever remaining faith they had in the nation’s core political institutions. And then, boom—Shariah. It’s almost too perfect. *Correction: An earlier version of this story misidentified the name of Gaffney’s organization. We regret the error.